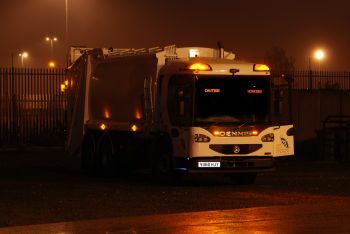 To make 2011 a safer year for refuse and recycling workers, and to prevent fatalities, vehicle safety technology specialists Innovative Safety Systems Ltd (ISS) are recommending that ‘Caution Workers’ lightboards are fitted to caged 'litter pickers' and refuse collection vehicles (RCV's). The Health and Safety Executive has repeatedly highlighted waste management as an industry with a high accident rate, and people who work alongside vehicles at the roadside are particularly vulnerable. In 2007, there was a fatal accident when a heavy goods vehicle collided with a caged litter vehicle, with a crew member working on the grass verge. ISS design, manufacture and supply high intensity LED light boards that can be fitted internally or externally to refuse vehicles, caged vehicles, road sweepers and any vehicle where there are workers in close proximity. ISS have designed a new exterior ultra-rugged waterproof lightboard that is durable and robust in the most demanding conditions. West Lindsey District Council is equipping its new fleet of Refuse Collection Vehicles with the full lighting package from ISS, including LED strobe lights and ‘Caution Workers’ lightboards fitted to both the front and rear end of the vehicles.